Welcome to the most amazing city in the world! If it’s your first time, well sir or madam, you’ve got your hands full! There is a gazillion things to do in London, more than someone could ever do. But you gotta start somewhere, so start with the below. If you’ve managed to finish these then check out my list of more unusual things to do. Buckingham Palace, the Royal icon of London, is surrounded by beautiful parks: Hyde Park, St James Park & Green Park. Make sure you walk them all and burn those fish & chips! Although you can visit it on your own, I recommend you take the free tour from Sandemans instead to get a bit of context on what you are seeing. It covers these areas and a bit more of what I mention below. If you are around at 11.00 AM you can see Buckingham Palace’s change of guard. Last, towards the most western part of Hyde Park you will find the lovely Kensington Gardens and Kensington Palace which you can chose to visit inside. These are all mostly great shopping & eating destinations just in the heart of the city. Again the guidelines are to just walk around and go check out the places that call your attention. Start in Oxford Circus and check out the big stores. If you are the artsy type the most prestigious art galleries in the New Bond St and they are free of charge, usually with pretty cool exhibitions. If you are the luxurious type or just like window shopping the expensive brands make a turn on Regent Street. A nice store to visit is the Liberty London Tudor builiding building, gorgeous on the outside and inside. After that, walk into Soho for more shopping or eating. The best bars and restaurants are here. If you are a music lover drop by Ronnie Scotts, a legendary jazz club, or Ain’t Nothin but Blues Bar – which I also mention in this article. 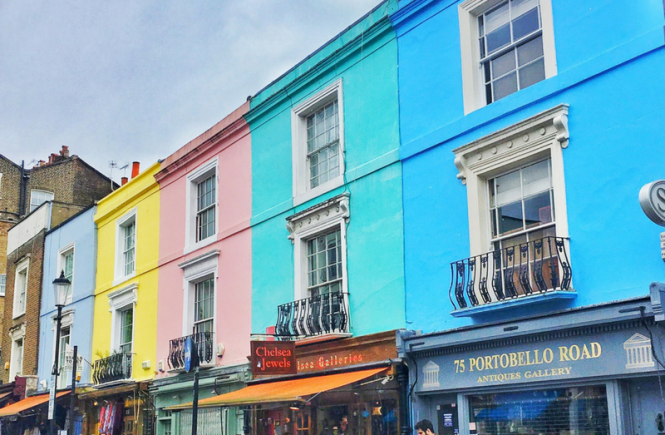 Last, head to Covent Garden’s pretty cobbled streets, walk through the Seven Dials, where seven streets converge, and make another shopping stop at Covent Garden Market. Also a stop in the Sandemans tour, you can’t leave London without a picture of the most famous, tallest and biggest clock tower: Big Ben. Close by you’ll find Westminster Abbey where the coronation and burial ceremonies of British Royalty take place. It’s a majestic gothic abbey but if you are not into churches at all it’s fine to skip and just enjoy its outside as it’s pricy. The famous Leicester Square is well known due to its concentration of cinemas and theaters, this is typically where the big movies premieres take place so if you are lucky you may spot some celebs. Then walk down to Piccadilly Circus, the British version of the Times Square for a picture of its neon signs. Your visit to London isn’t complete without watching a musical in the West End. If you haven’t seen Les Miserables, the West End version is impeccable. Have an inner child? Then you might try Wicked. Looking for something different? Then go with Book of Mormon, from the creators of South Park. There is no rule for buying the cheapest tickets unfortunately, what I usually do is check Amazon tickets and the app TodayTix and then compare the prices with the play’s official page. If you are unsure about the seating, then SeatPlan is your friend. This London neighborhood is famous for its markets: Camden Lock Market, Stables Market & Buck Street Market. You can find all kinds of things, from clothing to antiques and great street food. Camden is also famous for selling bizarre & “alternative” clothing and items. You mustn’t miss the Cyberdog store, it will blow your mind! The are also has great pubs & bars, some with live music, great for a night out. Another London neighborhood, most famous for the Portobello Market, the largest antiques market in the world, and for, well the movie! 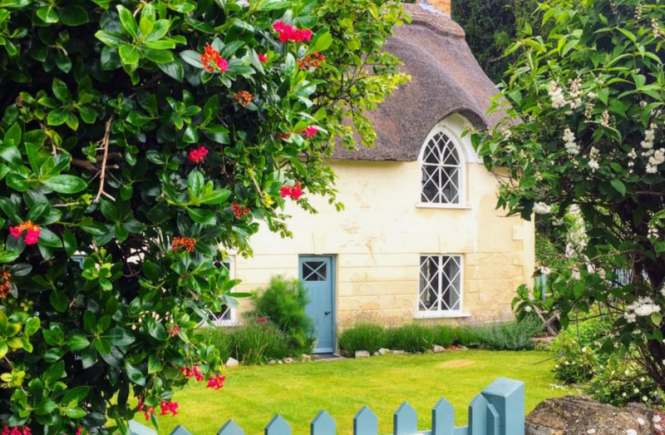 The main street features colorful houses and cute antiques & vintage clothing stores, great for a photo op. Tower of London, one of my favourite tourist attractions, this historic castle, founded in 1066 is a gem of British history and great entertainment. Don’t be put off by its entry price, it’s worth it. Make sure you allow enough time to visit and try to book online to skip the line. Right outside you’ll find the famous gorgeous bridge you see in all London pictures which is not London Bridge, it’s Tower Bridge so don’t confuse them! If I have to choose something that represents the UK and brings its inhabitants together, I choose the pub. The pub is everything! The pub is for eating, drinking, meeting with family and friends, etc. Grandmothers and grandparents go alone, or with their children and their grandchildren, even if they are newborns. In the morning, at noon, in the afternoon and at night. It’s always a good time to go to the pub. You must try the English Breakfast or “Full English”, which typically consists of eggs, bread, sausage, bacon, mushrooms, baked beans, roasted tomatoes and hash brown. A delicious bomb! And in many places they make their vegetarian or vegan version. Perfect to start a long day of sightseeing. At lunch or dinner, have Fish & Chips. It consists of cod or haddock breaded in a mix of beer, eggs and flour, and then fried. Finally, many chips as a side. And to drink, have a pint of beer! Start by visiting the beautiful Cathedral of St Paul, if you wish to go inside you need to pay. The Thames river is also one of London’s main icons and walking along it is a lovely experience. Alongside it you’ll find the Shakespeare’s Globe, a reconstruction of the Elizabethan Globe theatre. The original theatre was created in 1599 and demolished in 1644. You can go see a play for as little as £5 (standing). It is also beautiful inside. As a warning, your English level will affect your experience – most plays are in old English and even natives struggle to understand it! Last, you MUST go to Borough Market. It’s one of London’s largest food markets which means lots of variety, yumminess and free tastings! Try to avoid weekends if possible. British Museum: Go if you are into ancient stuff. Imperial War Museum: Go if you are into knowing more about WWI & WWII. Museum of London: Go if you want to learn more about the city’s history. National Gallery: Lots of old art, think from Renaissance (think Italian religious art) to Modern (think impressionism) but no new stuff. Natural History Museum: Think lots of stuffed animals, dinosaurs. For nature fans. Science Museum: Go if you are really into science, all kinds of machines and how things work. Tate Modern: Newer art, you’ll find modern (from not so long ago) & contemporary (from today) art here. It’s on the Thames so you can visit it while you walk along it. Victoria & Albert Museum: Decorative arts, really awesome colorful things to see! Another gorgeous park of the city located in Central London. Bring yourself a nice picnic, and head to Primrose Hill, also in the park, for great views of London. Abbey Road: get your version of the Beatle’s cover! Follow the steps of the fab four and take picture on the famous zebra crossing featured on the Abbey Road cover. This is a real street used by real cars so just try to not get run over by a car. Right besides it is Abbey Road studios. Also, be careful, the crossing is not on the Abbey Road tube station but on St John’s Wood station which are in completely different places in the city. Although the only thing you might be able to buy here is food, this luxury department is a must visit. You’ll find the crème de la crème on everything: clothes, decoration, electronics, food, toys, health & beauty and the list goes on. Be prepared to be wowed by the offerings, and by how expensive they are! Your visit to London is not over without a great picture of London from above! For this you have several options: The London Eye, The Shard or the Skygarden. As I explain in this post the Skygarden is the best and most budget friendly option (it’s free), but it gets booked really in advance so you might have to consider the other two if you are a bad planner! This royal palace and it’s gardens are beautiful, fun and full of history. I do recommend visiting them – better on a sunny day! The visit takes at least half day as it’s located in Greater London and there is a lot to cover. You’ll take great pictures! 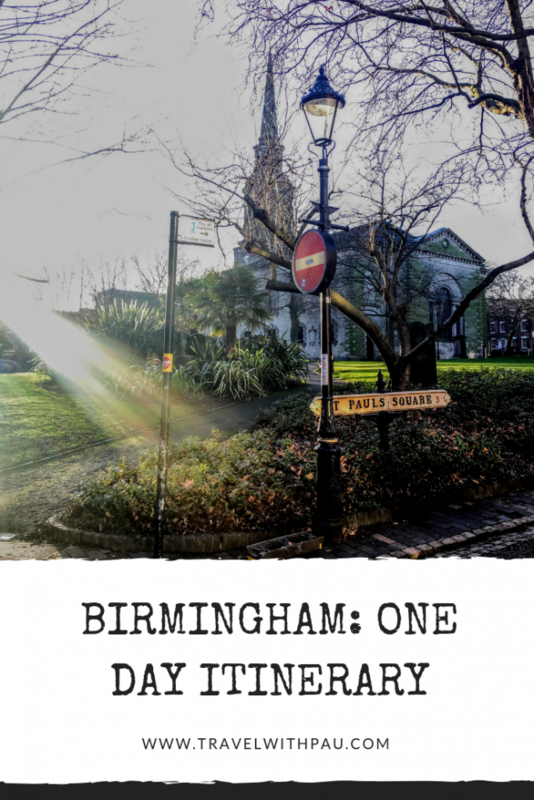 Having visited Birmingham four times in less than three years, I thought it was high time to write something about it. My last visit to Birmingham, and a few before, were to attend concerts. The last band I saw was Black Sabbath, whose members are Brummies, and chose the city as their last spot for their last ever tour show. So, yes, heavy metal was born in Birmingham! That may make it more interesting for some of you. For those with less context, Birmingham is the second largest city in the UK, but small in comparison to London. So one day is actually not bad to get a good look at it! It’s actually very easy: almost everything you need to see is within walking distance from the station. You will most likely start from the train station. If you are driving, the Town Hall parking is not expensive or you can park further out and walk your way back to the center. After leaving the station, walk seven minutes to Victoria Square. This is one of the most beautiful squares of the city. Here you will find the City Council which is beautiful, stop for a picture! You will also find the Birmingham Museum & Art Gallery which is also interesting and it’s free so you can at least pop in for a few minutes. After that, walk four minutes to the baroque St Phillip’s Cathedral. 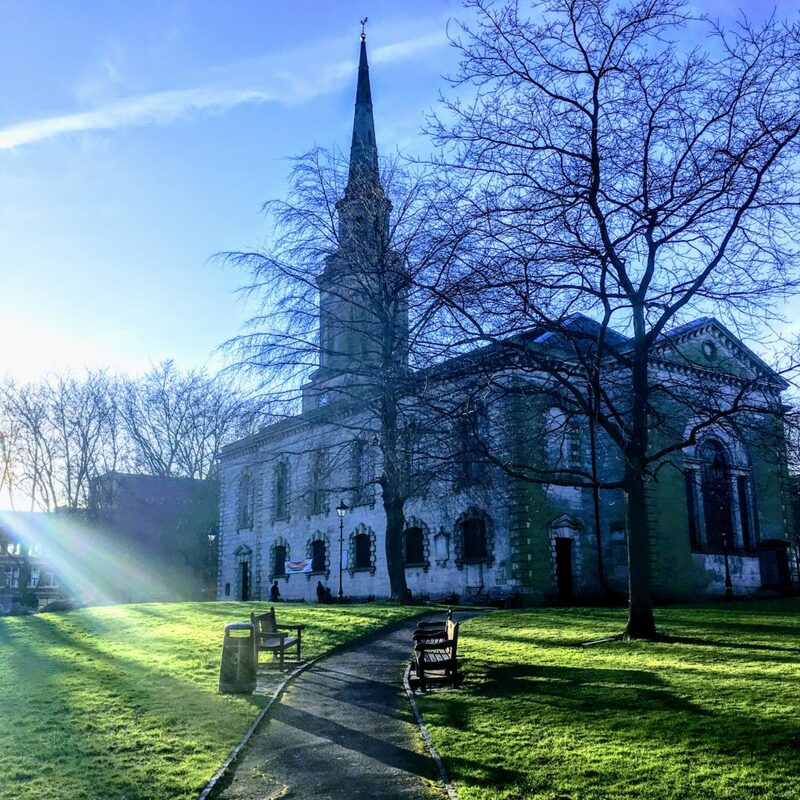 Walk around the square and admire UK’s third smallest Cathedral from the outside or inside. Exit St Phillip’s by Church street and walk straight, you will get to St Paul’s Church & Square which is also very nice. Walking an extra 2 more minutes, you will arrive to St Paul’s Gallery. This is one of my favorite spots in Birmingham! It’s the world’s biggest exhibition of album cover fine art. It includes pieces signed by artists and band members including Pink FLoyd, Led Zeppelin, The Who, David Bowie, Eric Clapton, Jimi Hendrix, etc. I bought a print of Pink Floyd’s album cover Meddle signed by the cover artist and Nick Mason here! There are also a few pop art pieces as well. The Jewellery Quarter in Birmingham is Europe’s largest concentration of businesses involved in the jewellery trade, and produces 40% of all the jewellery made in the UK. But what do you care? Well, the reason why it has become a tourist attraction is that many of the workshops retain their 19th century appearance. What stood out for me is a lot bright red bricks, the architecture does look actually pretty cool. A short walk around it will do – try to find the giant padlock sculpture for a photo op (see below). As most of the UK, Birmingham also has great Indian food. I found out about Hen & Chickens on TripAdvisor on my first visit. When I went there I was a bit skeptical as the place is basically a run down pub, but my skepticism vanished when the food arrived. It was glorious. I ate there four out of four times I visited the city. I wasn’t a vegan then but came back recently and it is vegan friendly (I had the Tharka Dhal). If you are not fond of Indian another great option is The Warehouse Cafe a Vegetarian award winning cafe with tons of Vegan options. They had me at vegan chocolate brownie with ice cream! Walk back to the center to The Bull Ring, Birmingham’s major commercial area which has been this way since the Middle Ages! Today, there is a huge shopping center there which encircles the church of St Martin in the Bull Ring. You will quickly recognise the area because of the Selfridges building which is covered in thousands of shiny discs and looks pretty cool. While shopping or roaming around, take a picture with The Bull, a tall bronze sculpture of a bull inside the shopping complex which is a symbol for the area. Probably all the walking has made you hungry again. On my quest for a vegan treat I found the Cherry Red’s Cafe Bar. They have tons of vegan options, sweet or savory. I had the Vegan Red Velvet cake which was amazing. The decoration is quirky and fun. You can take a bus or train from where you are in England, use GoEuro that shows you all the options in the same search. 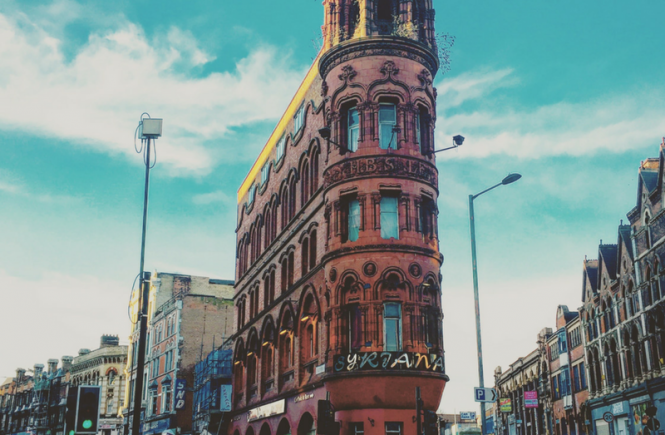 Need to spend the night in Birmingham? No worries I’ve got you covered, I’ve pre filtered the best and cheapest hotels, click here to start booking one. Last, if you need a visual of my itinerary please find the map with the walkways and main sights below. Hope you enjoy your visit! This post contains affiliate links. If you click on one and make a purchase, I might make a small commission, at no extra cost to you in order to help support my blog.